Trading mutual respect more than insults, the UFC 234 pre-fight press conference still carried plenty of intrigue. You don’t need bad blood to make exciting fights, and that’s good news for the combatants of UFC 234. Four fighters who have always let their fists do most of the talking took the stage ahead of their main and co-main appearances at Sunday’s [Saturday US] sold-out extravaganza, and managed to ramp up the anticipation of their respective showdowns without getting mired in stew of insults. As they did when they coached opposite one another on The Ultimate Fighter, middleweight champion Robert Whittaker and challenger Kelvin Gastelum were ultimately cordial to one another, and has been the case since TUF, both men were careful to give respect where respect is due and never mistook confidence for arrogance. “Kelvin is next in line. He’s the biggest hurdle in my way in terms of me developing myself,” explained Whittaker. Middleweight contender and rising sensation Israel Adesanya has a wit nearly as sharp as his fighting game, and it was on full display throughout the festivities—except when it came to his opponent. For a silver-tongued assassin like Adesanya, it was a rare anomaly of admiration. “I’ve seen the odds this week and I’m like ‘Man, y'all must have forgot,’” he said of the wagering odds that solidly favor The Last Stylebender. Witnessing the reaction of the crowd, one would never guess that Anderson Silva is neither a champion nor Australian. Time had clearly not diminished the enthusiasm for seeing a legend in the flesh, and the crowd seemed nothing short of tickled at the prospect of the dynamic Brazilian squaring off against one of their own. And like the other fighters he shared the stage with, The Spider radiated only respect for his opponent. “He's a great talent who will have a great future in this sport...I'm very impressed. He's a great fighter...I'm very likely to come here and fight Israel on this card." Knowing Adesanya’s past admiration for The Spider, it was inevitable that Silva be asked if it was possible that his opponent knew him better than he knew himself. For some athletes, such a statement would be a trigger, but for Silva, he saw it as a sincere compliment. 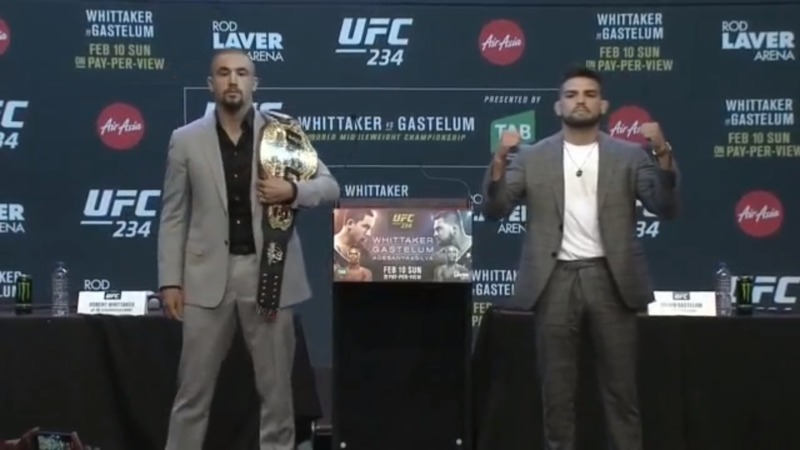 Watch Robert Whittaker and Kelvin Gastelum faceoff at the UFC 234 pre-fight press conference. Without the tangible benefit of being an Aussie/NZ fighter or a former champion, Kelvin Gastelum at times appeared the odd man out in the proceedings, but he took it all with the class an aplomb that has been his calling card as a middleweight. “There’s a positive side to all this,” he explained with a smile. Steve Latrell is a writer and producer for UFC.com. You can follow him on Twitter @TheUFSteve. Kara-France: "I'm Not Just Trying To Win"